The first station that this crowd put on the air was Radio 220, but in April 1979, they became Southern Radio. The station could be heard on Sundays across South East London on a number of frequencies before settling on 1413 kHz. They had a rock music format and also featured free radio news in The Tender Trip programme presented by Iain Johnson – the alter ego of John Burch, one of the main people behind the Caroline Movement. 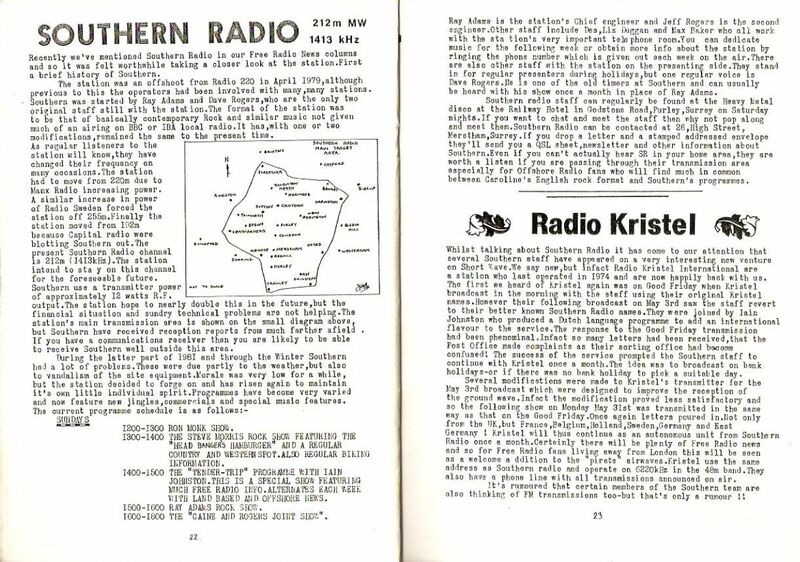 Around this time, some of the same people could be heard on Short Wave as Radio Kristel International. In August 1983 there was another name change to South East Sound, firstly on 1386, then later 1188 or 1179 kHz, but always announcing 253 metres. The mainstream rock music and presenters stayed mostly the same and included Geoff Rogers, Keith Archer, Benny James and Dave Windsor. They ended up being one of the last AM stations South of the Thames, lasting until early 1986 when founder Ray Adams was prosecuted and fined £1000. Some of the site crew and presenters later took to short wave on a number of stations such as WFRL, WNKR and WGAS.